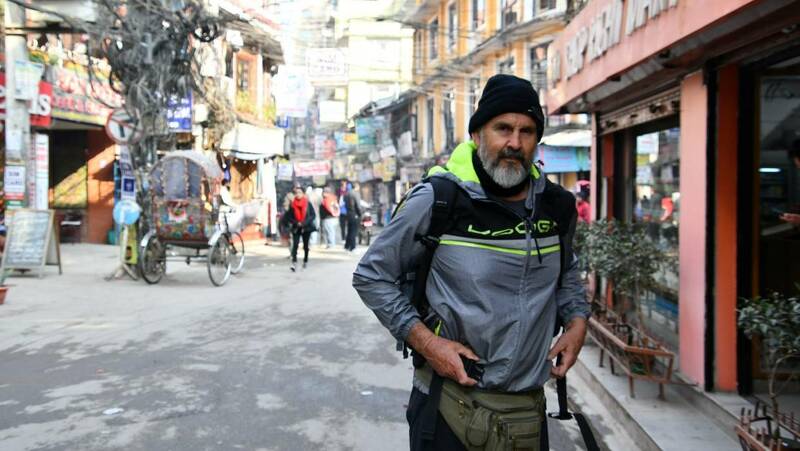 Sixty-two-year-old Kevin Bardsley says he didn't think too deeply about taking on Nepal's 200-kilometre Annapurna Circuit Trek until the day he was set to leave New Zealand. "I did not get nervous," the Waikato grandfather of three says. "Because I did not know what to be nervous about." When his younger son asked whether he knew that dozens of people had died on the circuit in October 2014, Bardsley replied that he did. "But even that didn't make me nervous. 'Cause we were doing it mid-winter. Logical. Not!" At 100kg, Bardsley, who is 6ft 3in (1.9m) tall, says he was about 10kg overweight and "couldn't and wouldn't" shift the extra bulk. Looking back, he admits he'd become lazy. While he had excelled at multiple sports at school and later "dabbled" in marathons and multi-day triathlons, he'd become much less active since his three children, now in their 30s, were born. He'd done three three-day tramps - Lake Waikaremoana, Queen Charlotte and the Northern Circuit - and numerous one-dayers, but had become a bit blase about the New Zealand bush, saying "it's all the same!". Each birthday, he likes to take time out for himself and, last year, somehow he got it into his head to climb the Waikato's highest peak, 959-metre Mt Pirongia. "Near the summit, I met a kindred spirit, George, and we struck up an instantly friendly relationship on the final climb." Heading back down together, they had a good old chinwag about everything from tramps around New Zealand to their hopes and dreams. Traversing Mt Karioi together a fortnight later, George told Bardsley that the adventure group he was a part of, Got to Get Out (GTGO), planned to walk the Annapurna Circuit, one of Nepal's classic long-distance treks, in three months' time. When George asked whether he'd be keen to join them, it only took him half a second to answer "hell yes". Bardsley, who designs operating theatres, specialist procedure rooms and major infrastructure for the Waikato District Health Board, says that until that moment he thought his days of overseas travel were behind him. The following day, he put his money where is mouth was and signed up for the trip, having no idea he would be around twice the age of most other group members. 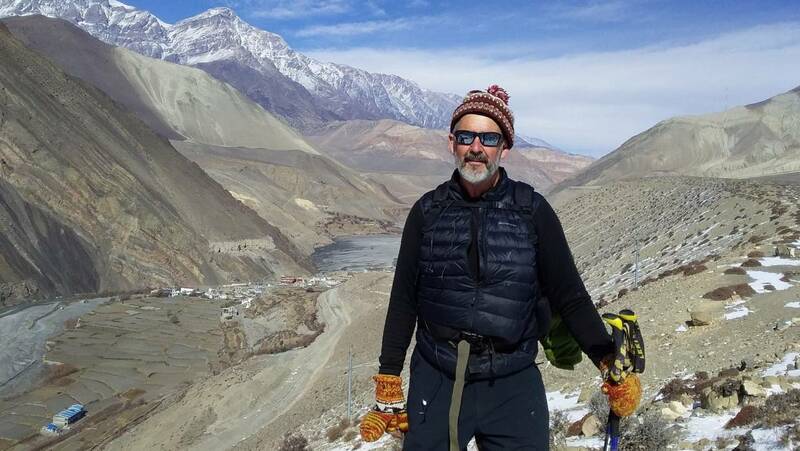 With the trip just two and a half months away, Bardsley embarked on an emergency training regime, summiting 952m Mt Te Aroha, the highest peak in the Kaimai-Mamaku range, three times; walking for up to five hours at a stretch along the Karamu Walkway; and climbing the 1349 steps to the Hakarimata Summit to practice walking with poles. He did enquire as to why they were tackling the circuit in mid-winter, but was perfectly satisfied with GTGO founder Robert Bruce's answer: "no people". "In his opinion, it is also the best and cheapest time to visit Nepal," Bardsley says. "The lack of people was also my ideal. And the weather turned out to be perfect for all but the dangerous Thorong La Crossing… If we'd had no snow it wouldn't have been as exciting." Following the Marsyangdi Valley to the north of the Himalayan range, the Annapurna Circuit has long been considered one of the best treks in Nepal and one of the world's classic walks. It traverses landscapes ranging from alpine to subtropical and an arid semi-desert similar to the upper Gandaki Valley in Tibet. The climax is the iconic 5416m Thorong La Pass, the scene of the October 2014 tragedy. The views of the surrounding icy peaks from the summit are meant to be outstanding but Bardsley and his group didn't get much time to contemplate them - a snow storm hit "with full force" five minutes after their arrival. Weathering the storm was "spooky", Bardsley admits. As were the the "difficult descent over 2000m in fresh snow, the final whiteout and the loss of our path down to safety." Led by their two local guides, the group made it safely to Muktinath Mandir, an important pilgrimage site for Buddhists and Hindus, within eight-and-a-half hours. Bardsley's assessment of the pass: "exhausting but rewarding". Bruce says Bardsley more than managed to keep up with the rest of the group, whose average age was about 30. "Kevin was extremely supportive of others, very humorous and had surprisingly excellent taste in music. He was part of the glue of our trip with fun anecdotes and stories and was often hiking at the front of the group." Bardsley's not one to blow his own trumpet but reckons he didn't do too badly either. 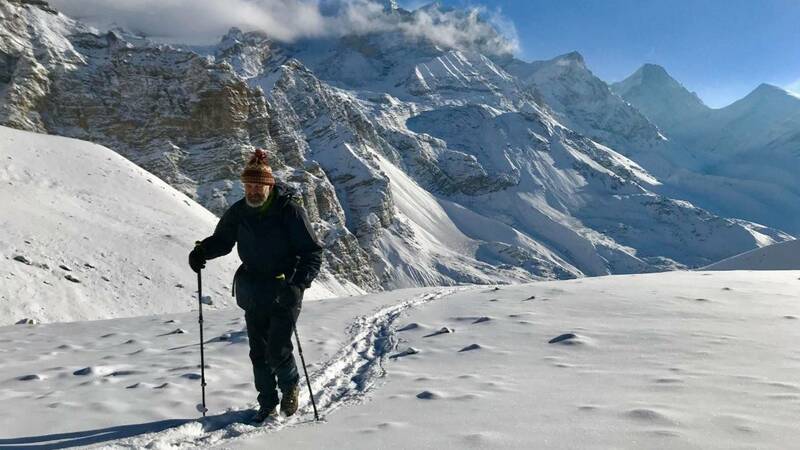 Trekking for between five and 10 hours a day, he says his travel doctor's advice to take "granny steps" proved solid. "I found descending the hardest as I have arthritis in my feet, probably from years of long-distance jogging. Continual descending gives me acute forefoot pain. But I recover quickly." 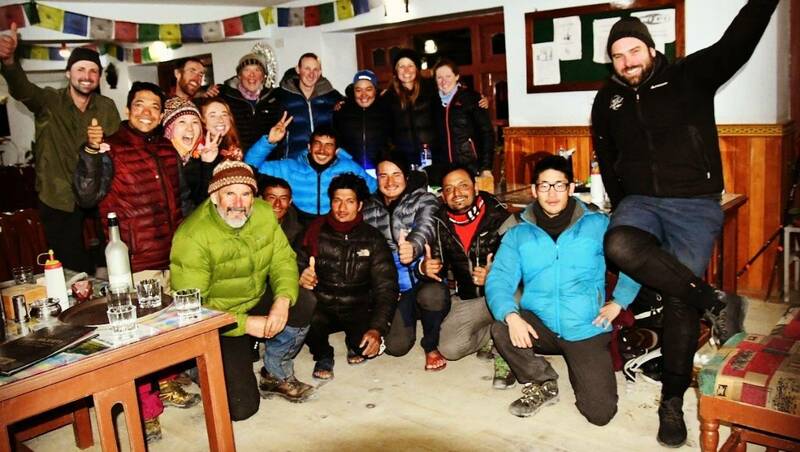 The exceptionally high altitude - trails in Nepal climb higher than the summits of the tallest mountains in Europe - was a concern for the whole group, but Bardsley says they acclimatised well. 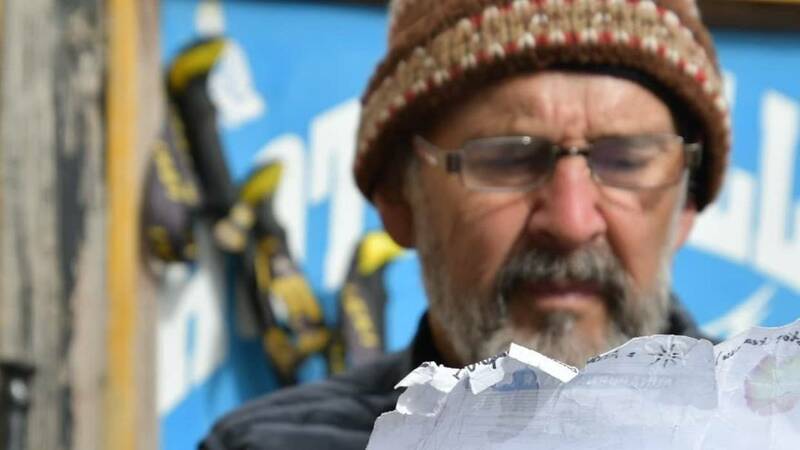 While he suffered shortness of breath at elevations of more than 2500m, he "found no part of the trek too arduous physically or in any way mentally challenging". He only got ill, he says, when he returned to work. Halfway into his first day back, he realised he should probably see a doctor and was diagnosed with "near pneumonia". "At altitude, I - and others - were coughing up every night just to clear our lungs of gunk before sleeping, but I slept well 95 per cent of the time. 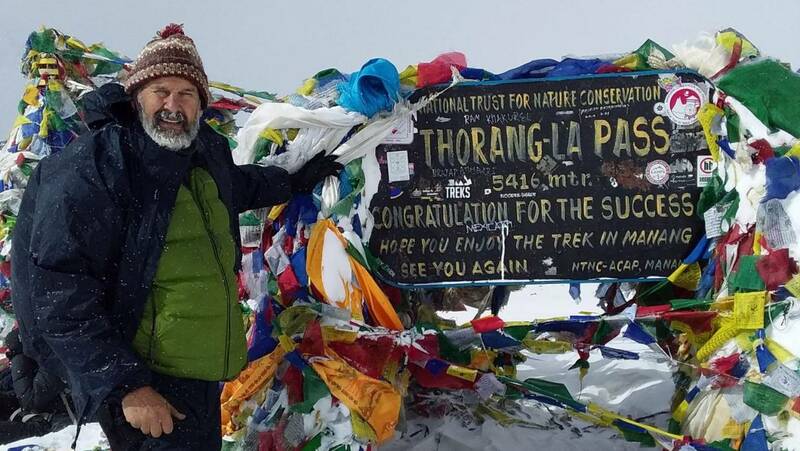 Perhaps I should have sought treatment at the time but there were few medical facilities and the language barrier…"
Thorong La Pass aside, he says there was only one time he felt fearful on the trek - and that was for others' safety rather than his own. "I did worry for a subset of our group who elected to traverse from the 5000m high Tilicho Lake visit, returning at night in the pitch black. I kept a vigil for them by lying on the couch in front of the pot belly and occasionally casting my eye out for their torch light." 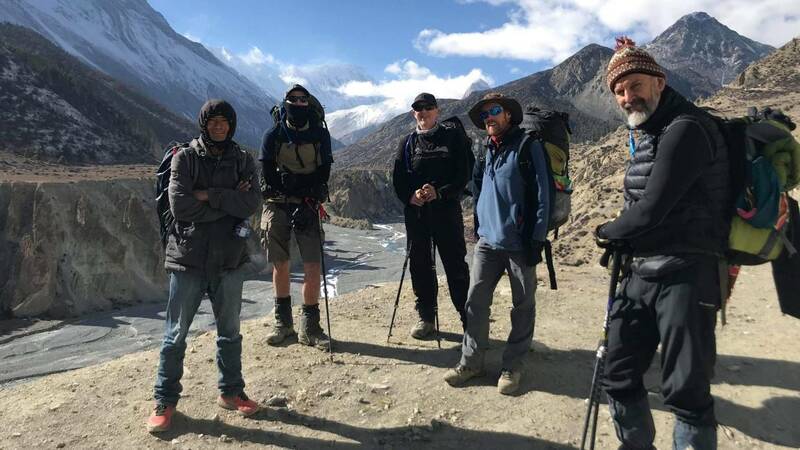 The highlights of the hike for Bardsley were the "grandeur" of the mountains, experiencing the simplicity of life in the villages and spending time with the other group members and the local guides, porters and taxi and tuk tuk drivers. "I think [Nepalis] are among the loveliest, most peaceful people on Earth, but all seem to be living on very limited incomes and I observed less than fair opportunities." Now fully recovered from his near pneumonia, Bardsley says "I feel like a new person as I have 10kg less to carry around." He wonders now why he put up with the extra weight for so long, saying he feels fitter, healthier and better about himself than he has in a long time. He reckons it's taken a few years off his appearance too. Getting back into hiking has made him realise how many "closet trampers" there are in New Zealand too; people who have given up or forgotten the pleasures of venturing into the wilderness since having children. "While training for the hike, so many of my friends and workmates have revealed they also used to tramp. I was not very aware of this. So I have motivated them and they have motivated me." Believing that keeping active and hanging out with young people are key to staying young yourself, Bardsley encourages those feeling old, overweight, unfit or simply unhappy to get outside. Pronto. "Our nation is suffering from an obesity epidemic. I work in the development of tertiary healthcare facilities and our capacity is always stretched. We must deal with the epidemic ourselves. Don't hesitate; make the decision to get out."